I am a parent of a non verbal child. He has always been that way and possibly always will. It’s our ‘normal’, so much so that I often forget when others look at my son or ask him a question that they have no idea he can’t speak. Sometimes I want to tell the world everything about him, because he can’t do so for himself. Other days I want to keep everything about him private and locked into my heart because…well mostly because people, sadly, can be very ignorant. This one doesn’t offend me but it does make me laugh. Just because a person can not speak does not mean they can’t make noise! My son can scream so loud he frightens the birds away for miles. He makes a lot of noises both with his mouth and with his body. He cries, he laughs and he shouts…it’s just words he can’t make, not noise! He is at least ten times louder than his very verbal sister! This one makes me realise just how much emphasis we seem to put on spoken language when, in fact, it is actually only a small minority of what we as humans use to communicate. I carried my son for nine months, when he was a newborn baby I interpreted his cries when he was hungry, tired or wanted comfort. Nine years later and I still know how to interpret his actions and needs. I can follow his eyes, see his face light up in laughter or he can lead me by the hand to what he wants. He is an incredibly gifted communicator, actually more gifted than many of us who have become complacent in our use of spoken language. He uses google street map to take me to the doctors when ill (you can read more about that here), he uses photographs of places we have been to to request to go again and he uses objects like the TV remote to say he wants to watch TV. He may not have speech but he can still get his message across. It is us who need to learn to listen not him who needs to learn to communicate. I know people want to be positive and offer hope. I get that. I understand that people don’t understand severe autism, global delay and learning difficulties fully and base their experience mostly on what they have read or heard from the media or friends. People don’t mean to hurt me when they say this, but it does hurt. While my heart would love my son to speak to me suddenly in sentences, with the exception of a miracle, that isn’t going to happen. There are only three recognisable vowel sounds in his ‘vocabulary’ at almost ten. He has ‘o’ (sounded out like awww) and ‘mmmmm’ and ‘ahhhhh’ when eating but these are considered so infantile his expressive language has been assessed at approximately 6 months old. It has remained at this age for three years with no signs of any improvement. As hard as it is for society to accept; there are people who never develop speech and remain non verbal all their lives. There is offering hope to people and then there is false hope. The latter can destroy and damage so much. My son MAY say some words one day but the reality is he is more likely to remain non verbal. I can accept that and I hope one day others will too. I can understand why people would think this. Of course, like any other person, my son has times of frustration and anger. Mostly these, like any other 9 year old, are actually because he can not have his own way rather than directly due to his communication struggles. He IS understood and he IS happy. My son has never known any different. It isn’t like he had speech, became reliant on it like us, then lost it. He has always been non verbal and he has found his own way to communicate on his terms. If people take the time to get to know him they can tune into his needs and wants fairly quickly. Out of everyone in my family he laughs more than any of us so his inability to speak certainly isn’t making him angry or frustrated all the time, anything but! While it may be annoying having your child whining or nagging for something when you are busy, or asking a million questions all the time, how would you feel if you never heard your child say ‘mum’? Of course I get sad sometimes, I would not be human if I didn’t. There are moments it catches me off guard, like when I see my daughter singing Christmas carols or when someone asks me what my son wants for Christmas and he can’t tell me. On the other hand I have become much more grateful for the times my son climbs on my knee at 9 to show me something on YouTube he likes, or the times he squeezes me hard and still wants me to lift him up even though he is almost my height. When he takes my hand as he climbs out the car or rests his head on mine, he doesn’t need words to say how much he loves me. Yes a part of my heart feels the pain of never hearing his voice but I am anything but heartbroken all the time. I have a bond with my son which is like nothing else. Silence says everything when we are just sitting together and those moments refresh me whenever I need it. There are so many more misunderstandings about children like my son. Sometimes I deliberately don’t tell people he can’t talk because they immediately seem to stop talking to him just because he can’t speak to them. That upsets me, but more importantly it upsets my son. I have had other parents tell their children to avoid my son out of fear that perhaps his non verbal status is somehow contagious. People generally equate non verbal with ‘not with it’ which could not be further from the truth with my son. In fact if he ignores you it says far more about you than him! Being non verbal is not holding my son back, society is. It is ok to not know about something you don’t have personal experience of but please be willing to learn. I am a parent of a non verbal child. I don’t need to be his voice because he is perfectly capable of making his own needs and wants known in his own way: He just doesn’t use speech to do so. Isaac loves his iPad. It is with him from the moment he wakes until the second he goes to sleep. He has a few games he likes and he really enjoys looking through the photos but his all time love is YouTube. He is pretty typical of many 8 year old boys in that sense. However there is something very different about Isaac: he has no spoken language at all. Isaac has severe autism as well as other complex medical issues and he has poor eye sight. He can not read or write and certainly can not type into a you tube search bar. He fumbles his way through you tube by clicking on random videos and spends most of his day flapping in delight at lift doors opening and closing over and over again. When Isaac does listen to songs they tend to be very random or theme tunes of favourite programmes aimed at very young children like ”Peppa Pig’ or ‘Wooly and Tig’. He rarely allows anyone else to touch his iPad so he has to go on ‘rabbit trails’ through lift videos or episodes of Wooly and Tig to find anything different. Due to the nature of the video playing app he tends to be faced with a fairly limited repertoire but this has suited him immensely due to his need and love for repetition. I am not afraid to admit I often struggle to parent my son. He gets frustrated (I absolutely understand that) and that can lead to hours of screaming or throwing himself down the stairs or hitting and pinching people. He has severe phobias of things I can not control like open doors or other children (including his sister) eating and drinking. His life has to be the same all the time which makes living with him quite restrictive. He is not toilet trained nor can he care for any of his own needs. Some days I get very low and I question ‘why us?’ My faith has been taken to levels of testing I never knew existed before. Then one night last week I stopped what I was doing and just sat beside my son. I longed to hold him but I knew he would attack me. My love for him was overwhelming yet I was unsure if he even knew who I was. I sat beside him on his bed and I could feel the tears building at the back of my eyes. I have not been able to take him to church for weeks now because of his outbursts and his inability to cope with the slightest change. Had God forgotten about my child? Did my son have any idea of the world around him or how much he was loved? I was weeping for my child. My heart was broken both for myself and my son. In that moment I heard words that seemed to come from God himself. A male voice I had never heard before. The words caught my heart before my brain even fully processed them.. He pulled that bar back to the exact spot again and again as those words washed right over us both. I was weeping for a child I thought I had lost but here that same child was showing me more than his own words ever could in a way so powerful, so emotional and so spiritual it was like God himself was in that room. I can not explain how he found that video. I can not explain how he understood those words and related them to himself. I have no logical explanation to the timing of me arriving in his room and him finding it or the fact he would scroll right back to the start of that chorus time and time again. We sat there together for what felt like hours. The words of that song healing places in my heart I had not even realised were broken. It was an experience I will never forget. My non verbal severely autistic son with complex medical and developmental needs brought me to tears by using you tube to communicate something I will never forget. Isaac can not speak to me but God can use any means he wants to give him a voice. That day he used you tube and this song. Isaac was so excited. He had watched so many trains come and go from the busy platform while he flapped, clapped and laughed at the doors opening and closing and the whistle blow as each train pulled away. He loves trains and even more so when he gets to ride on them. Our train was due next so I held his hand and gathered up our bags. I knelt down beside him and told him we needed coach B and we would sit at a table. I was unsure if he understood as at 8 he has complex autism, learning difficulties and a brain tumour. I had already prepared him though and just the day before we had been on the same train for the journey down. He had loved that journey and I was sure he would love this one too. But as I helped him over the large gap and headed for our booked seats on the busy train I had no idea of the huge meltdown I was about to face. The seats we booked were not where they should have been and instead of a table of four we were instead booked to sit on a row of two with the other two seats behind. No amount of explaining would work and Isaac sat down in the aisle of the busy train and screamed. He screamed and he screamed. He banged his head and bit himself. He shook and kicked his legs. He could not cope with such a simple change as a different seat. It was awful. He was scared. I was scared. He was crying, his sister was crying and I was crying inside. It was like a scene from a horror movie with all eyes on the train on me and my son and I had no idea what to do. My son was a danger to himself and others and was causing an obstruction on a busy train that was unable to stop. I sat on the floor beside my traumatised son and tried to calm him as a member of the train crew approached us. Through the noise and distress of my son and his sisters crying I somehow managed to explain to the assistant what the problem was. Immediately she did everything she could to help. She checked every carriage on that train for a feee table but there was none available. I tried to see if Isaac would sit on some fold out seats near a window or perhaps even stand at the door. I had told him we would be sitting at a table together and that was all his brain could process. One little change had disturbed him so much his body was in crisis. And then a stranger offered to help. With tears in her own eyes she came down to where I was and said she could see the distress of my son and would he like her table seat. She was not angry or frustrated, or even annoyed; she showed compassion and gave up her own seat to see my child happy. I thanked her and we sat at her table and immediately Isaac began to calm down. Everyone was looking at me and I was waiting for a stare or rude comment or cheeky remark. We got none of that. All I saw were people moved by what this lady did and by seeing a child with special needs so upset. I was so touched but more was to come. As the train employee returned she handed me a bag. She apologised for the booking mistake, gifted us a whole bag of food from the buffet trolley and called ahead to our destination and booked assistance for us. She then asked what Isaac enjoyed doing and when I said he loves pressing buttons she lead him through the entire train and let him press buttons at doors, toilets and even on her ticket machine. She turned Isaac’s distress to utter delight. As I walked through the carriage and past the passenger who had give up her seat I looked at her and cried. She too has eyes filled with emotion as she watched my son laugh as the toilet door opened when he pressed the button. Yesterday I witness kindness on a scale that changed me. I saw not only autism awareness but autism acceptance and compassion. Instead of stares I saw smiles. Instead of rudeness I saw understanding. My child is not badly behaved or spoiled. He was highly distressed over a simple change that I had no control over. He was told something would happen and that didn’t go to plan. He could not voice what was upsetting him and he was scared we were on the wrong train since we had no table. I cried when my son had a meltdown on a busy train yesterday because I hate seeing him so anxious and scared, but I also cried at the actions of complete strangers and simple acts of kindness that I will never ever forget. I found this bag this morning as I was sorting though our luggage. It reminded me again of yesterday and why I cried when my son had a meltdown on a busy train. Communication is much more than words. Isaac has severe autism. He has no spoken language. He has global delay, significant learning difficulties and NF1. He struggles with lots of things in life ,but yet there is one thing he excels at and has done for a few years now: he has taught himself to communicate via google street map! It is a different way of communicating, but for him it works much better than speech or any traditional communication app. Wherever I take Isaac, wether it is somewhere he is familiar with, or hundreds of miles away to a place he has never been before, he has a special talent of retracing the exact route once home using just google street map and his incredible memory. In the summer of 2014 when he was just six year old we went on holiday to a cottage 120 miles from home yet a week later he retraced the exact route we travelled including stopping at the very same service station we took a comfort break at! I was amazed that a child who has no understanding of numbers or letters and barely turned when his name was called could hold such an incredible talent. I was sure it was a one off. He attends a school for children with complex needs and is transported there in transport alone for his own safety due to challenging behaviour and seizures. His school is 14 miles from home yet he takes himself there by memory via google street map every afternoon once home and sitting in ‘his’ chair. I put this ability down to the fact he does the same journey daily. I wondered if he had the location stored. One day I watched him. He uses google street map for his every communication need now. If he is hungry he goes onto the street map and travels from his home address to a restaurant nearby and brings his iPad to me to show me. If he wants to go out he uses google street map to show me where he wants to go, from the church he goes to every week, to the train station, and the local park. He takes himself to his grans house and to shopping centres to tell me he wants to go and watch lifts. He has discovered he can enter a local hotel using google street map and this has opened up new unique ways for him to communicate too. He tells me when he requires his continence products changed by taking himself to the hotel, going inside and finding the toilets! He goes into rooms in the hotels and finds an ensuite to communicate he wants a bath at night. When ready for bed he moves around the rooms until he finds a bed and points to it. He finds my car in the driveway to ask to go in the car. He finds a clothes shop in the high street to ask me to get him dressed. When he was highly distressed one day and I could not stop him screaming I put on google street map and he moved around until he found a house with a door open to show me that there was a door open somewhere he could see and this was what was causing his distress! I was in awe of his ability to find such an ingenious way to communicate. Two weeks ago though he shocked me once again. He was more lethargic than usual and quiet (he may not speak but he makes a lot of noise!). He came and sat beside me and used his skill on google street map to take himself to the doctors surgery! For the first time ever he was able to communicate that he was feeling unwell! This was incredible. I cried. It was nothing serious thankfully but to be able to say he communicated he was not feeling good to a doctor was amazing. Isaac is not a genius. He can not write his own name, dress himself, read or write or use cutlery. He requires round the clock care. He can not speak one word. He is severely autistic yet he has found a way to connect with others that is as unique and special as he is. Google street map has helped millions find their way in life but none more so than one non verbal autistic little boy named Isaac. How my sons inability to speak is tearing our relationship apart. This is something I have never written about before or admitted to anyone, but I have always struggled with my relationship with my son compared to his sister. I don’t love him any less nor do I favour one above the other but there is something that prevents me being as close to him as I am to his sister: his inability to speak. The older he gets the more it is literally tearing us apart and that breaks my heart. We are both trying, we are determined to try and overcome this but no matter what we do it is always there lurking like a dark shadow. We play together, we ‘read’ together (well I read to him! ), we share games and we eat together but it is incredibly hard to reach into him when he is non verbal. That breaks my heart. Having no spoken language at all really affects my son so much. Having no language at all at almost 8 years old has forced him to be more independent. He can’t ask for help or even ask for something to eat. So he uses his physical skills to open the fridge and help himself or open the front door and take himself out. The other night he took himself to bed because he was unwell. He has in the past brought me a cup or a bottle of juice and I have found him sitting at the table with an empty plate in front of him too. I would love to be able to hear him simply say ‘mummy, I have a sore head.’ Or ‘can I have something to drink please.’. He won’t always have access to the bottle of juice or cup to let others know what he wants. Having no language is making him frustrated and angry. I know if, like his sister, he could talk about his day at school and let us know what has upset him we could help him calm down and share his day with us. When he looks at a box of toys and points it is incredibly upsetting for him when we continually have to guess what it is he wants and we frequently get it wrong. He gets upset at certain programmes on the television but has no way of telling me why so he gets angry instead. He finds open doors highly distressing but has no means to tell me why so instead he becomes frustrated and violent. Speech would help us resolve all these issues. Some will be quick to suggest sign language or picture communication but these are so limited and his inability to make the right sign or find a relevant picture just make him even more angry and frustrated. Having no language means he is at the mercy of others to communicate on his behalf. Could you imagine having a wonderful holiday, printing out all your photographs and yet someone who wasn’t even there with you decides to tell everyone about YOUR holiday without allowing you to say a word? I am certain you would find that irritating and annoying and you would become very cross. This is what is happening every single day when I send my non verbal son to school. Adults dictate what information I receive on my sons behalf and tell me (if I am lucky enough!) about the experiences he has had. It’s not what I want. It’s not what my son wants either! He wants to be able to tell me about his day, his way! When I pick my daughter up from school she tells me about her favourite pencil breaking, the games she played at playtime and the funny shaped banana a child had in their packed lunch box! This is life from her perspective and something I can never ever get from her brother. A huge chunk of his day is a mystery to me and he has no language to enable that gap to be bridged. Have you any idea how difficult and heartbreaking that is for us both? It rips our relationship apart. Having no language is life limiting for him. He will never be able to read to me, or to anyone else. He won’t ever be able to use his voice to tell a joke or share a story. He won’t be able to sing or even give me cheek. As he gets older he will not be able to use his voice to ask a girl out or even say ‘I do’ on his wedding day. Asking the price of an item in a shop, asking directions, even telling the bus driver where he wants to go are all going to be difficult if not impossible. He is likely to need someone with him to support him throughout his life. Using a telephone is never going to be easy and connecting with other people will always be much more complicated. We have tried alternative methods of communication. 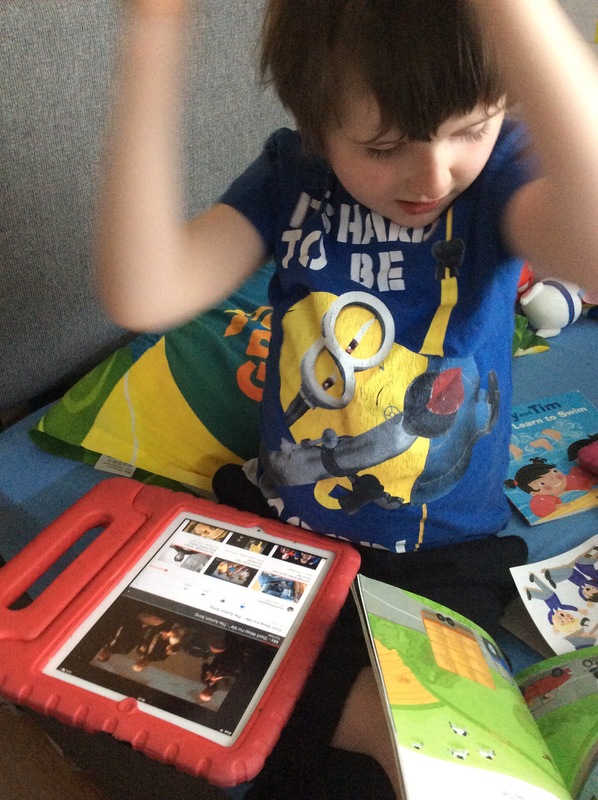 We spent years trying makaton but he can’t manage the signs himself and is struggling with picture communication too. I know if he could speak so many things would be different. I know if he could speak we would be so much closer. How do I know this? Because he has a twin sister and my bond with her is strengthened every single day through language. She tells me about her day at school, her worries, her achievements. We play together and I join in her games because language enables us to play together. She reads to me and with me. She can tell me what she wants and I can listen. She shares her emotions, her ideas; her life with me through talking. The more she talks to me the more we bond. The less my son is able to say the communicate the more our relationship is strained. I am working on my relationship with my son every day. We have a very special bond and a deep love but there remains an invisible problem between us that is tearing us apart: the fact he is non verbal.